In the first two weeks of the protests, they achieved nothing. 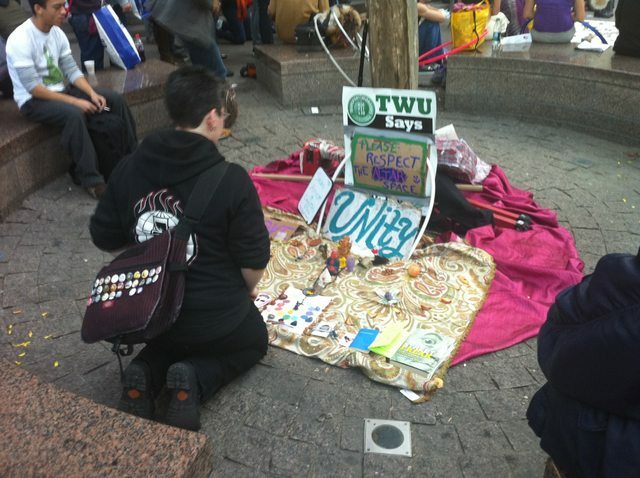 Their tactics seemed similar to the NYU Kimmel occupation, except for lacking explicit demands. In the next two weeks, however, they were spectacularly successful. First, a mass arrest brought them to media attention. Because they were permanent, they were a sustained news story. The media had something to talk about on a regular basis, and it was even more outrageous than the Tea Party; so, they lapped it up, and the entire country learned of the protest. This seems to have happened out of a necessity from the way the protest was set up. Occupiers committed themselves to a 24-hour protest regime. But there is only so much protesting that can get done sitting around; so, they got up and marched through the city on a daily basis. On October 1 this march took them to the Brooklyn Bridge, where, ignoring multiple warnings from New York police, they blocked traffic, and were subsequently arrested, as a group of 700. Most of the arrested enjoyed their temporary martyr status and went right back to protesting. The fact that they did not go home after being arrested separated them from the NYU Kimmel protesters, and placed them in the hallowed realms of the civil rights movement. After the arrest, copycat occupations began all across the United States. Their goals were twofold. First, to hold a General Assembly where all could voice their complaints. Second, to successfully “take over” and “occupy” a public space, creating a sacred space protected against the evils of capitalism that could nurture and grow the General Assembly. This second goal annoyed some police officers, so supporters of the protests were able to talk about the difficulty of their goal and the suffering they went through to achieve it. But what happens after these goals are achieved? You’ve set up shop in a park, everyone is happy with the Assembly, your “people’s mic” is obediently bringing the message to the crowd and Twitter. Now, what does the Assembly do? For the majority of people, this isn’t even an issue. The act of occupation, and the difficulties it raises, is the primary focus. The journey is the destination! Occupiers busy themselves distributing food and blankets, linking protesters to each other and the bathroom, recruiting new protesters, working out disagreements within the group, and making friendly contacts with lawyers, media, elected officials, and, yes, local businesses. There are always improvements that can be made in these areas. I just removed Adbusters’ verbiage about the “one demand” from the home page of OccupyWallSt.org. It makes no sense to mention a demand that doesn’t exist. Let[‘]s forget about the demand and promote what this movement already is. We are building the community we WANT in this world. One that feeds, shelters (if we could…), and cares for all it’s members. A community that hears every voice. Our job is to help the people rise up, not to have a privileged white middle class discussion about how we should ask the government should “fix” itself through abstract financial reform. I want a revolution, not another broken promise from a corrupt government. The only demand I’ve heard so far at the GA that I felt I could get behind went something like this: Rather than demanding something from the 1%, we should make a demand of the 99%. We demand that the 99% start forming general assemblies in their own communities. We demand that the 99% organize to take back the world stolen from them by the 1%. There we have it, straight from the horse’s mouth: even if some Occupy protesters wanted very simple change, the person who runs the website would never declare success if some mere tax or health care bill was introduced. The goal of the protest, as defined by its organizers, is to replace the government with the Assembly. Is this an achievable goal? It may be in the future, when the failing economy is finally working people harder than they can stand. But for now, no. The situation is bad but not bad enough to inspire socialist revolution. And the Occupy movement, living large off of donations from the corporate world, is doomed to rupture and die. Whether it dies with dignity and grabs a bit of political power — disbanding the occupation, and reforming into a Tea Party-style group that meets up on a regular basis — or whether it falls apart as a core of true believers tries to stick it out through the winter is really up to the mob at this point. The demand to occupy Wall Street originated with a campaign in Adbusters magazine in summer 2011. Adbusters set a time and place, with the goal of “thinking big”, without any clear plan for what would be done hour-by-hour once the squatters had arrived. This was the beginning and end of their involvement. A mass movement is needed: one that understands that these attacks are aimed at permanently destroying public sector unions and vital social services, one that unites all sectors of the working class and uses many tactics with the goal of pushing back this assault. Indeed, the CUNY group’s method of achieving a feeling of egalitarianism while discreetly managing the protest itself brought new stability to the grand dream of occupying Wall Street. One of the last updates on the Bloombergville website invites viewers to a joint General Assembly with Occupy, which soon becomes a series. When a puff piece promoting Occupy hits the Washington Post on September 15, two days before the squatting begins, we can see the same poster has been modified just slightly to promote Occupy, demonstrating that the use of Assemblies was not a mere suggestion but represented the full integration of the CUNY group into planning. 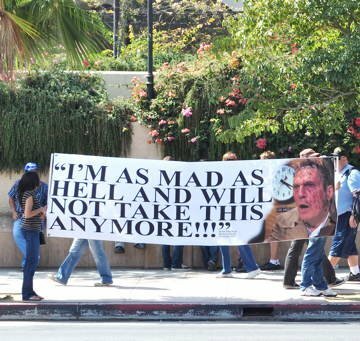 Some of the August planning was leaked in the form of e-mails leaked by Andrew Breitbart, from a secret mailing list called “september17discuss“. These e-mails demonstrate basic distrust between anarchist and socialist factions of the protest, which is only natural, given that anarchists want to eliminate all control, while socialists want control over everything. Harsh words like “thuggish mafiossi” are exchanged, and hippies advise the list to stop hating so much and “hug [it] out”. Members of the CUNY group, which was primarily socialist, stress that they speak only for themselves and are not trying to create a socialist bloc within the planning list. When a student leader named Will Russell was criticized for expressing his dissent with anarchist factions of Occupy in the Village Voice, he defends himself in these e-mails, saying: “As an individual I fully stand with the GA, which we have all worked so hard together to build.” (Russell himself, the e-mails reveal, is affiliated with the International Socialist Organization.) This planning team worked hard to shape the protest’s decision-making process so that it would be ready to go on September 17, while maintaining an illusion of democracy. In fact, the e-mails attest to the fact that many aspects of the protest were preplanned and ready for media consumption by the end of August. The slogan “we are the 99%” (which mailing list members admit “works great as a rhetorical slogan, but unfortunately is not true”) and the Tumblr blog were among the products of the secret mailing list. Legal information was completely worked out to allow the occupiers to remain for as long as possible. In the Village Voice interview, Russell accurately notes, “Some of our GAs have gone for seven hours”. The General Assembly is not an efficient way to run a protest. Rather, the Assembly is an interesting innovation: it uses the idea of the filibuster as political spectacle, and simply extends it to the entire decision-making process, so that the entire Assembly is a spectacle of people droning on for hours about petty distractions. Everyone is encouraged to share their opinion, even if their opinion is superfluous or nonsense. The use of the “people’s mic”, an idea roughly a decade old, triples the length of every speech. Its model of “consensus” ensures that decisions take a very long time to reach, and when forced to make a decision that effects all its members, the Assembly may splinter into two. The General Assembly makes for great entertainment for the masses on Twitter. The incessant speechifying built into the system practically invites Internet users to get out the popcorn and follow along, and it leaves the viewer with a sense of thrill, of having witnessed “democracy in action”. But in an emergency, the Assembly would be unable to respond with anything approaching haste. Given the effort with which the CUNY team “built” it, one suspects that it is not meant to. Rather, the goal is to transform the very meaning of the protest. Before the GA, the purpose of protests was to state demands and leave. Before the GA, an “occupation” was built entirely on an external shared goal. With the novel system of Occupy, the purpose and goal of the protest is to draw attention to the General Assembly. If people want the protesters to issue demands, they must come to the Assembly in person and talk it out, or start their own Assembly elsewhere. When occupiers arrive, they do not force attention away from themselves and onto the evildoers, but contrast the evil of the outside world with the goodness of the democratic Assembly. Without the Assembly, the vague idea of occupying a square to create a refuge of goodness against global evil is too bizarre to work. The protesters have nothing to do with their copious free time, and may indeed be seen as a nuisance. With an Assembly, preferably a very long one, the protesters are seen, at least to possible new members, as having a Purpose. The more attention the Assembly can draw to itself, the more its method can be propagated throughout the country, and throughout the world. What the government and corporations are not, the Assembly is. On this unstated but firm belief, the movement was born and achieved impressive strength, and on it it will die. “Before [Nietzsche], no one knew the tempo of history,” said Spengler. “Nietzsche lived, felt, and thought by ear.” He had no teacher to explain to him how the music rose and fell. Still today, this music has never been rendered a perfect science, but remains an intuition among those few, noble historians who can trace a path from tapestry to skyscraper. How shall the 21st century be seen to the players of the Glass Bead Game? How shall its world-rhythms be felt in the hearts of the psychohistorians? The peak oilist John Michael Greer, who obsesses over sanctifying skills that will be needed in our grandchildren’s time, possesses a strong historical awareness, and has predicted the appearance of cargo cult movements in America. It is interesting to note the influence of American culture on the examples supplied by him and others of revitalization movements: cargo cults, Ghost Dances, UFO prophecies, Great Awakenings. All of these have the indelible imprint of American culture — the belief that man can shape his own destiny, and that the failure of a well-intentioned ritual comes only from a lack of sincerity or numbers. Germany, where the Will to Power means something more than the feeling experienced when a ritual is performed, will not have cargo cults. England, currently 80 years into a humiliating decline (Japan surpassed their GDP in 1963! ), does not have any. Most of the West suffers material decline with grace. But in America, the slightest material losses of the 1970s led to the Faustian bargain of 1980, which brought us Reagan-Bush-Clinton; and now that the devil has shown signs of wanting to reap his side of the bargain, the obvious predecessors to cargo cults are manifesting themselves. I will not become hyperbolic, as political writers so often do, and claim the cults are already among us. Yes, there are the get-rich-quick schemes of the day, and strange beliefs about money appearing on doorsteps through positive thinking. These omnipresent American superstitions, which have always entranced white and black, young and old alike, have not yet become linked with institutions of power. Nor will I accept politics up until now as the product of a cult. Yes, Reagan-Bush-Clinton promised a prosperity that will not last. Yes, the election of Obama had a weird mass superstition around it, something about using the Presidential post to complete the work of the civil rights movement, as if slavery and racism were not an indelible aspect of our history but a curse placed on us by an evil wizard, which was the only thing standing between us and success, and which we could make a clean break from by chanting the right spell at the ballot box. These things are slightly irrational, but they are readily understood, and politics has never been a rational sport. No, the cargo cults which are to come will not be born directly from either of these currents, although they may adopt some of their traits. Rather, their direct ancestor shall be the unique flavor of political protests which have spilled into America’s cities since 2007. The basic flavor of these protests is the centuries-old battle of left versus right, but some odd new elements have appeared. The protests are not “about” a single issue, nor are they even about “raising awareness” of an issue which does not personally affect the protesters. Rather, they aim to express a feeling of unease generally, gaining relief in the knowledge that they are not the only ones with this odd malaise. The primary complaint is that the government (to the Tea Party) or the corporations (to the Occupy movement) do not represent them, i.e. that these powers are not stitched from the same cloth as the “ordinary folk” protesting. The message of the protesters is not that America together can be made better, but that Americans are losing control of themselves to an outside force which also resides in America. Neither side discriminates on the basis of race, for they are true Americans. But it should not be too surprising that the people who subscribe to this narrative of losing control are overwhelmingly white. This alienation from power contains the seeds of defeat. To be sure, both sides may win temporary victories. But the feeling of protest will continue, even if the protests themselves end. Both sides must remain on guard against an enemy that manifests itself in a far more insidious way that mere policies. Therefore, engagement in a political party is not helpful to the protesters, and may in fact be against their principles, since both political parties are agents of the Enemy. Lacking any strong idea of what they are there to protest besides the Enemy Himself, the protests lack direct confrontation with anyone. Sure, there is the counterprotester and the occasional annoyed policeman. But there is no attempt to move the group beyond the feeling of protest. Soaking in the vibes of shared discontent is good enough, and thus these are not protests but Be-Ins. Both sides are allergic to political action or organization of any sort that might attract the Enemy to their movement, to the extent that the population of both movements is primarily on people who have physically shown up at a be-in, and secondarily those who sympathize with the be-ins, and they wish they had attended. Not for anything they could have achieved, you see, but because it would have felt nice. The protest of 2007-2011 does not lead to any further action, but it is meant to make things change merely through its own impact, and its failure comes only from lack of numbers. The protest cannot be concentrated at any single place and time, for the Enemy is everywhere. Instead, like the Ghost Dance, protests appear throughout the country, all performing the same ritual, repeatedly over a span of months. Most of the elements of revitalization movements are already here. All that is missing is the actual revelation, that is to say, a clearly marked strategy to defeat the Enemy and save the country, one that has nothing to do with how the world actually works, but is just crazy enough for Americans to try. We are not yet ready for the revelation, because we are not helpless enough. But economic decline will do that to you. At some point in the next 50 years, the protests will transform into a full-fledged cargo cult, attempting to regain lost prosperity through the repetition in every major city of a completely irrational and bizarre ritual that vaguely resembles a political protest. Naturally, this will be a secular revelation. The prophet will not be a religious figure, but rather, like Rick Santelli, Alessio Rastani, Glenn Beck, Michael Moore, or Howard Beale, a news commentator. Perhaps it will come in the form of a new economic or political theory. It will be, in essence, an American revelation for a very American response to imperial decline. Corporate forces of the world … have participated in a directly racist action by accepting the contract from the State of Georgia to murder Troy Davis. The only way to reconcile this conflict is if the protesters agree that they have both been betrayed by both forces of evil, and that the one they thought would solve their problems also failed them. Obviously, the Occupy movement has been betrayed by Obama, whom many of them must have placed their hopes in. With the economic climate, more betrayals are certainly on the way. A Yale opinion poll recently generated some news for claiming that Tea Partiers deny global climate change. In fact, it shows that their opinions are divided 55-35, certainly out of step with mainstream political groups, but nothing like a unanimous consensus. 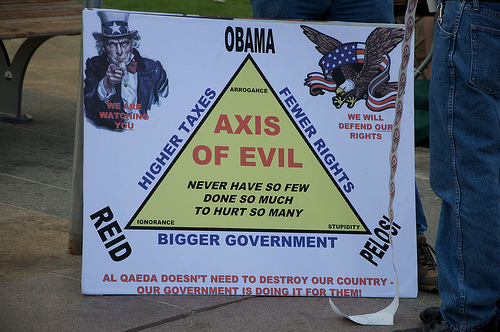 Where the Tea Party does excel is in its firmness of belief. This does not mean they possess a religious commitment to climate change denial; presented with some imaginary shocking new evidence, they claim they could change their minds about as easily as Democrats. But 52% of them need no more information to reach a firm conclusion on global warming; their minds are completely made up (compared to 17-22% of other political groups interviewed). 50% have absolutely no concerns about the issue. Exactly what gives its real dignity to the figure of Lincoln is that he stands invoking a primitive first principle of the age of innocence, and holding up the tables of an ancient law, against the trend of the nineteenth century; repeating, ‘We hold these truths to be self-evident; that all men are created equal, that they are endowed by their Creator, etc.,’ to a generation that was more and more disposed to say something like this: ‘We hold these truths to be probable enough for pragmatists; that all things looking like men were evolved somehow, being endowed by heredity and environment with no equal rights, but very unequal wrongs,’ and so on. I do not believe that creed, left to itself, would ever have founded a state; and I am pretty certain that, left to itself, it would never have overthrown a slave state. UPDATE: Lee Harris on “fantasy ideologies”. My friend did not disagree with me as to the likely counterproductive effects of such a demonstration. Instead, he argued that this simply did not matter. His answer was that even if it was counterproductive, even if it turned people against war protesters, indeed even if it made them more likely to support the continuation of the war, he would still participate in the demonstration and he would do so for one simple reason — because it was, in his words, good for his soul. The bourgeoise disdain tidings of salvation, not because we are clever enough to see through all delusions, but because we have an unbreaking faith that we are already saved. Evidence of our soteriological accomplishment lies all around us, in the stores that carry our material needs, in the machines that provide us with companionship and entertainment. We are aware, perhaps, that we ourselves are deeply flawed individuals. But something, somewhere, must have gone right for this world to be the way it is; that is the bourgeoise credo. Often enough, from this state of things both discomfort and curiosity emerge. This way of life does not, after all, make sense. We begin to understand that our lives are made safe and happy by civilization; that civilization has effects we cannot see, and that it is created by forces we cannot see; that its continued existence is by no means guaranteed. We may begin to study in books, to better understand how this time and place came to exist. And for the less historically aware, mysticism takes hold. Perhaps civilization is in danger. Perhaps it must be destroyed and replaced with a better one. Either way, a new path to salvation is laid out in the minds of the faithful, a series of stations ranging from practical, to obscure, to downright strange. A new object of devotion is found in the future state of humanity itself. With enough history on hand to know how these movements work, though, a true intellectual cannot become a mystic. Disillusioned by the universality of error throughout human history, we are forced to stand on the sidelines and observe the forces at work, occasionally calling foul when they make an obvious error. Being treated to this game in and out every month of the year, we often become trainspotters. A particular movement will take over our interest, and we will become better acquainted with its inner workings than the mystics themselves. In America, the “leftist trainspotters” catalog the splits and merges of Trotskyist groups; in Japan, the “kyosan shumi” do the same. In Japan, the “Aumers” gain an encyclopedic knowledge of the once vast and murderous occult group Aum Shinrikyo; in America, unfortunately, this job is divided between atheists pushing their ideology and religious scholars pushing theirs, with neither group recognizing the exciting possibilities of a trainspotter’s life. Trainspotters of the mystics always seem to be split between derision, curiosity, and sympathy. The last of these feelings may be the most profound. Mystics aim for nothing less than the creation of a new world in their image– and sometimes they are successful. For even though the mystics are often drawn to futile or dangerous activities, there is a creative power in their world that the trainspotters lack. For as we sit in our bourgeoise palaces, the concepts of laws, money, rights, government, society that we employ are nothing more than the unleashed and structured form of a latent mystical energy, the ability to believe in these unseen things and thereby determine how humans will behave. And to create a concept for tomorrow that does not exist today, we must again harness that power inherent in our minds. Mystics are the enemy of the individual and the bourgeoise, but perhaps they are a friend to humanity.